Global Positioning System (GPS) is a radio navigation system available worldwide. A fleet of 24 satellites orbit the earth broadcasting their position coordinates and highly accurate time code. Each satellite is equipped with atomic frequency standards, they are widely used for time synchronization, frequency calibration, and navigation. GPS receivers can provide traceability to the national frequency standard maintained by NIST. The GPS signals are monitored in Boulder, Colorado by NIST. The frequency standard on each satellite is compared to the NIST frequency standard. Commercially available GPS receivers often provide a 1 pulse per second (pps) timing output, and standard frequencies such as 1, 5, and 10 MHz. Properly designed GPS receivers can provide traceability to the national frequency standard maintained by NIST. 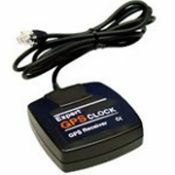 GPS Time Receiver– Global Positioning System (GPS) is a radio navigation system available worldwide. A fleet of 24 satellites orbit the earth broadcasting their position coordinates and highly accurate time code. Each satellite is equipped with atomic frequency standards, they are widely used for time synchronization, frequency calibration, and navigation. GPS receivers can provide traceability to the national frequency standard maintained by NIST. The GPS signals are monitored in Boulder, Colorado by NIST. The frequency standard on each satellite is compared to the NIST frequency standard. Commercially available GPS receivers often provide a 1 pulse per second (pps) timing output, and standard frequencies such as 1, 5, and 10 MHz. Properly designed GPS receivers can provide traceability to the national frequency standard maintained by NIST. PS/2- or DIN-keyboard interface (5V); free visibility of the sky – receiver needs to be located near a window or outdoor.